If you always think of a month as having 4 weeks, it'll blow your mind to conceive of it as having 3 parts. 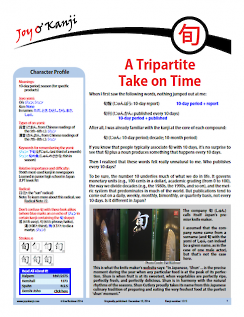 Learn how 旬 came to represent not only "10-day period" but also "season (for crab, strawberries, etc.)." See how restaurants use 旬 in coinages to convey that they're serving seasonal foods. Also learn about an innovative collaboration between a chef and a drug company! Jan. 18, 2019: p. 10: I found out that 旬のもの (しゅんのもの: thing currently in season) is a set phrase and mentioned that, altering the translation of the first sample sentence accordingly. Jan. 23, 2016: p. 9: Enlarged the photo and revised and reformatted the photo caption. Jan. 30, 2015: p. 8: Deleted part of a photo caption about how the name お龍 (おりょう) has a puzzling yomi and how one usually reads 龍 (dragon; imperial) as りゅう. That is true (at least these days), but the same photo caption includes the name 竜馬 in which the 竜 (the Joyo counterpart to 龍) also has the yomi of りょう. Therefore, I shouldn't have singled out the yomi of 龍 as an anomaly. Dec. 19, 2014: Originally published.